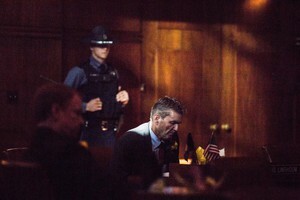 by OPB Staff OPB Feb. 8, 2019 3:05 p.m. | Portland, Ore.
Two dozen Democrats in the Oregon House want an apology from a state senator who blamed a black man’s death at the hands of New York City police on tobacco taxes. Garner died five years ago after being choked by officers attempting to stop him from selling individual cigarettes. In their letter, 24 House Democrats demanded an explanation from Linthicum. “At a time when the Capitol is working hard to improve its culture and build a better, safer environment for everyone who comes through its doors, actions like this demonstrate how much more work we have left to do,” it continued. Linthicum’s spokesman defended the press release Thursday, contending that Garner was selling cigarettes on a Staten Island sidewalk because New York tobacco taxes led to an illegal market for tobacco products — thus leading to the encounter with police. That’s an argument Garner’s wife has made publicly and that, in turn, has been seized on by some anti-tax conservatives.